A Natural Pool functions like a natural lake. The Living Pool looks exactly like a conventional swimming pool, but it is entirely chemical-free. How exactly do these systems work? What has to be taken into account when planning or maintaining them? Here you will find answers to frequently asked questions concerning Biotop pools. The shortest answer might be: With as little equipment and as much nature as possible. In the planning of Natural Pools, generally the ratio of the swimming zone to the regeneration zone is 1:1 and the depth is at least two meters in the swimming area. This is the basis for a functioning pool. If more technology is used, the regeneration area can be smaller with less depth. How does a Biotop Living Pool work? While in a Natural Pool the filter function is carried out by plants and microorganisms, in the Living Pool this function is taken over by a special phosphate filter with granules that bind phosphorus, the main source of nutrients for algae. As a result, algae growth is nipped in the bud, and the use of chemicals becomes effectively unnecessary. The water runs through a biological filter, which is housed under the decking. Here, impurities are filtered out and bacteria removed. The phosphorus contained in the impurities is broken down into dissolved phosphate. Then, a pump draws water from the biological filter and pumps it through the PhosTecUltra filter, where the adsorption process binds the dissolved phosphate. The pump runs continuously, requiring very little power to operate. A Natural Pool will "work" with the correct design of the regeneration area and the proper use of underwater plants. The pool is inoculated with zooplankton (water fleas, rotifers, paramecia), which play an important role in the cleaning process. All it takes is a little bit of patience until the pool finds its natural balance. How much space in my garden do I need for a Biotop Natural Pool? Having limited space in a garden does not automatically mean giving up a favorite spot by the water. The BIOTOP Natural Pool System works perfectly starting from a water surface area of 30 to 40 m². From there, the sky is the limit. Each Natural Pool is individually planned, and the optimal design is recommended depending on the amount of space available. A Living Pool require no plant filter of any kind to function, meaning that the size of your pool depends entirely on what you want and how much room you have in your garden. A Living Pool is often a more suitable choice for gardens, given the limited available space. Is the Living-Pool hygienically safe? The water in a Biotop Living Pool complies with all statutory hygiene regulations for private swimming ponds. Although public pools are subject to stringent water hygiene requirements, that is not the case for private swimming pools. Nevertheless, you can rest assured that the water in your Living Pool will meet the same high quality standards. Does a Natural Pool attract more mosquitoes? Mosquitoes are eaten by their natural enemies (water bugs, dragonfly larvae etc.) around the edges of the pool – that we can guarantee. Once the natural pool completed, all our client´s doubts are gone. Are there algae problems in the Biotop Natural Pool? Algae growth depends on many factors, such as outdoor temperature, sunlight and the nutrients present in the water, as well as on the technical equipment. In equipment-free Biotop Natural Pools some turbidity and increased algae growth may occur in the spring. The installation of a plant filter system is a reliable way to inhibit turbidity, while the Biotop Carbonator reduces algae growth naturally and permanently. Why not choose a conventional chlorinated pool? Chlorine is an environmental toxin and may even be carcinogenic. We can cite two studies that suggest that the combination of chlorine with flakes of skin, air or sun oil can lead to serious health problems. Children with neurodermatitis should not swim in chlorinated water under any circumstances. Nearly all of us have felt the unpleasant symptoms of swimming in chlorinated water at one time or another, such as dry skin; red, burning eyes. A Living Pool completely eliminates these symptoms, and what’s more, we can avoid damaging the environment by using chlorine or other chemical additives. 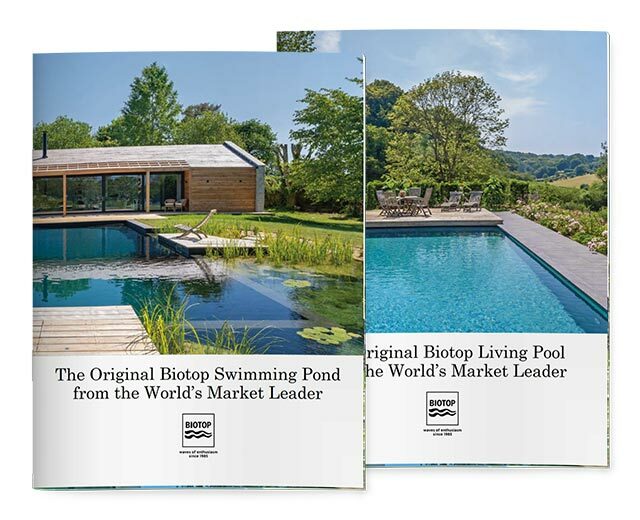 Biotop Natural and Living Pools are filled only once, unlike conventional pools that need to be refilled with precious drinking water every spring, and then emptied again every autumn, releasing thousands of liters of chlorinated water into the environment. How often does a Biotop Natural Pool need to be cleaned? In the annual spring cleaning the sediments that have sunk to the bottom are vacuumed up ("minor maintenance"). In the summer, the underwater plants have to be cut back. In autumn, maintenance work ranges from cutting the plants back once more to putting protective netting over the pool to keep leaves out. Every three to five years, we recommend carrying out major maintenance, where the regeneration area is cleaned out. At the customer’s request, a BIOTOP Natural Pool partner would be happy to perform both minor and major maintenance work. How much work will a Biotop Living Pool be for me? As the pool is filled with natural water that is purified without chlorine, it is normal for a natural biofilm to form on the walls of the pool, which is easily removed by a pool robot. You may occasionally need to lend a helping hand with a brush in places the pool robot has difficulty reaching. The pool must also be winterized, but these are just a few easy steps, as the water can remain in the pool. In the spring there is some work to do as well, but that can also be taken care of by the Biotop service team. In any case, the amount of work is limited to no more than half an hour – unlike conventional pools where so many owners groan about the heavy work load. Can a Living Pool be heated? A heat exchanger can be used to heat the Living Pool to a maximum of 28°C/82°F for swimming. Various pool covering systems can also be combined with the Living Pool, both enhancing child safety and reducing heat loss. What additional equipment can be used with a Living Pool? There is a wide range of possibilities: A counter-current jet, a neck shower, a solar shower or underwater lighting can add to the enjoyment to your pool. Does the Biotop Natural Pool require a great deal of equipment? Thanks to the pool's ability to self-clean biologically, no chemicals are needed. Auxiliary equipment is only used to get everything up and running more quickly, in other words to accelerate the natural processes.